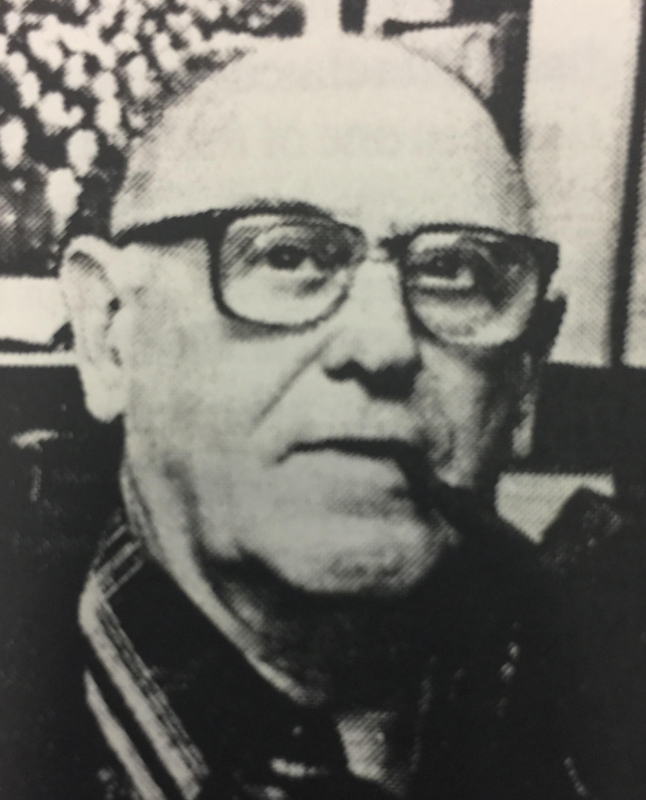 Editor's note: The SABR Salute, first bestowed upon writer Fred Lieb in 1976, was designed as a manner of recognizing the contributions of some of the older members of the Society. Subsequent SABR Salutes appeared in the SABR Membership Directory and honored members who had made great contributions to baseball historical research. Eugene Murdock (1921-1992) received the SABR Salute in 1991; the following biographical sketch appeared in that year's membership directory. When SABR held its 10th anniversary convention in Toronto July 24-26, 1981, the scheduled game of birdwatching (Blue Jays vs Orioles) was cancelled because of the player strike. We cranked up our own baseball game on the Erindale Campus — Canada vs USA — and one of the stars — along with Roy Hughes—was Professor Gene Murdock of Marietta College. At 60 years of age, he held the bat at the very end and swung with great confidence and authority from the left side. It is surprising to learn, after the fact, that he never played regularly with any team. Even in high school in Lakewood, Ohio, where he was born April 30, 1921, he was not the star player but sports editor of the school paper. That role established the pattern of his baseball interest as researcher and reporter. The first major league game he attended was Yankees vs. Indians at League Park on August 10, 1929. Babe Ruth hit his 499th home run off Milt Shoffner, a hurler Gene would interview many years later. Gene entered Wooster College in Ohio when war started in Europe in September 1939. With the military draft later hanging over him, he completed his BA requirements on an accelerated basis in December 1942 before spending three years in the Army, one-half of the tour in the European theater. Upon discharge in 1946, he entered Columbia University in New York to work with history professor Allan Nevins. It was that Pulitzer Prize-winning biographer who taught Gene the importance of oral history. (More about that later.) He received his MA in 1948 and Ph.D. in 1951. Dr. Murdock, who married Rita McColl in October 1950, served his first teaching assignment at Rio Grande College in southern Ohio in 1952-56. He then became assistant professor of history at Marietta College in 1956 and moved up to full professor in 1963. He was chairman of the history department from 1972 to his retirement in 1986, after which he became Historian of the College. Throughout this period, he belonged to many historical societies and associations, some of which he headed as president, as well as serving on different editorial boards. In April 1991 his fellow historians bestowed upon him the Ohio Academy of History’s Distinguished Service Award. Gene, who has lived all these years across the Ohio River from Marietta, in Williamstown, West Virginia, joined SABR as member No. 38 on September 10, 1971. He had published articles in Baseball Digest since 1965, and became a regular contributor to the annual SABR Baseball Research Journal. His first article, in the 1973 Journal, dealt with the contributions of 19th-century players, a field not well explored at that time. Most of his articles after that resulted from his substantial efforts in the field of oral history. From 1973 to 1987 it was “Have Tape Recorder, Will Travel” as he interviewed 76 former players in 22 states from Connecticut to California. Professor Nevins had given him sound advice to concentrate on the older persons and those not necessarily in the public eye. More than 80 percent of those interviewed have since passed on. The interviews ran from 30 minutes to five hours in two interviews for Lute Boone, a good-field, no-hit infielder, who was far more interesting to talk to than Lefty Grove, for example. Twenty-two of the best interviews, including a combined effort on Joe and Luke Sewell (The Tuscaloosa Twosome), are chapters in a 360-page book published by Meckler Publishing in June 1991. The title is Baseball Players and Their Times, Oral Histories of the Game: 1920-40. It is the latest of three baseball books Gene has authored. In May 1974 Gene wrote The Tragedy of Ban Johnson for the Journal of Sports History. Later he expanded this research on the long-time American League President, a former Marietta College student, into a 300-page book entitled Ban Johnson, the Czar of Baseball, published by Greenwood Press in 1982. Will Harridge provided some material for this detailed study, but the author was surprised and disappointed at the lack of historical information in the AL files. In 1984 Greenwood Press published Gene’s book Mighty Casey All-American. This 160-page volume is a historical and literary examination of Ernest L. Thayer’s masterpiece, Casey at the Bat. In the historical section, Gene analyzes the controversy surrounding the authorship of the poem and discusses whether or not there was a real “Casey” and a real Mudville — all tongue-in-cheek, of course. In the literary part he introduces and supplies the text for 75 parodies of the original poem. Gene’s contribution to the administrative side of SABR also has been substantial. He served as president from 1976 to 1978. Before that he was chairman of the SABR Hall of Fame Committee, which recommended improvements in the selection process, primarily of the Veterans Committee. One was a more balanced selection by era, as the 1920-45 era had far more players enshrined than any other. SABR did help get three 19th-century players enshrined but the Veterans Committee went ahead and put in an additional 15 players (including Tony Lazzeri) from the heavy-hitting 1920-45 period. Gene also headed the SABR nominating committee in 1981-82 and his proposal for two-year terms for the four operating officers was later implemented. Our 1991 honoree has had some rough going in recent years. Rita, his wife of 37 years, died suddenly in June 1987. Three years later, in May 1990, Gene was diagnosed with a malignancy in his jaw. Radiation cleared that up by fall, but the malignancy recurred in his abdomen in December 1990. He is now in remission. He did have one special thrill during his illness. Regrettably, it was not baseball-related, but that should not detract from this SABR Salute. Let it be known that on October 30, 1990, Professor Eugene C. Murdock fired a hole-in-one on the 188-yard No. 2 hole at the Minibel Golf Course, Vienna, West Virginia. It couldn’t have happened to a more deserving baseball scholar.